I like to sprinkle them with some good sea salt and I just sit there in front of the television and eat way too many. Something about cracking the soft shells open (oxymoronic, soft shells with a sharp edge to crack) and scooping out the almost bland yet still distinctly flavorful “nuts” is addictive and habit forming. And for me, they MUST be freshly cooked. Do you think this is a “Visayan” thing or did folks from the North do this as well?! I love boiled peanuts as well. I used not to know how to cook them until once, a visiting artist friend apparently did not know as well. She said you don’t have to boil them that long. She lived on a farm while doing research and that is how peanuts were boiled. After a few minutes of a rolling boil , she stopped the fire and proceeded to eat the peanuts, a lot of them after they had cooled down to a warm al dente. You can guess what happened that night and I’ll never forget. Good thing I had Imodium for the cramps and the runs. Yeah, there is no such thing as al dente peanuts as your digestive system can’t take them. In the US, it’s definitely a Southern thing. Can’t speak for the denizens of the Genuine North since I hail from Central Luzon where boiled peanuts is a frequently engaged in diversion if not a strong snack contender against binatog (kinulti). 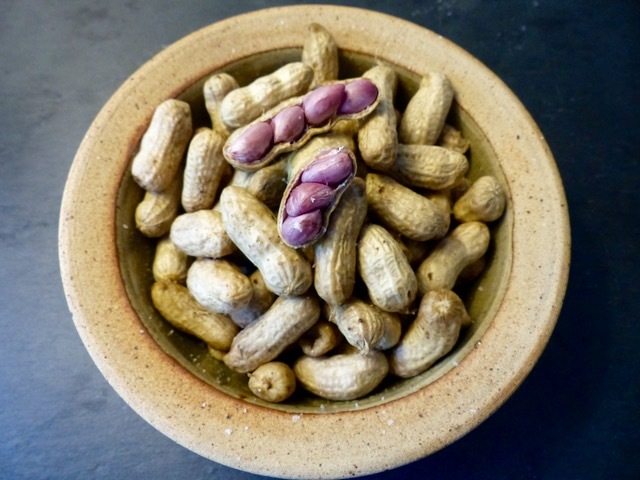 We get our boiling peanuts here (in Canada) from Subcontinental stores (Indian and Pakistani) so I guess eating boiled peanuts is also a popular homegrown recreation among them. I remember a few times growing up my grandparents would bring a bag over and we’d do the same as you. Just talk and crack them open and enjoy. I love the process of it! Ha ha, same here. I often take a U-turn to get back to stalls I passed along the road, that sell fresh peanuts. I also love the earthy smell when they’re cooking. Any leftovers you can dry in the sun, and then you get a Chinese-y treat of salty, desiccated goodness. Definitely not only a Visayan thing….here in the Bay Area I see fresh peanuts (oddly since it’s still winter but having early summer weather) in the farmers market but looks like only popular with Asian people. 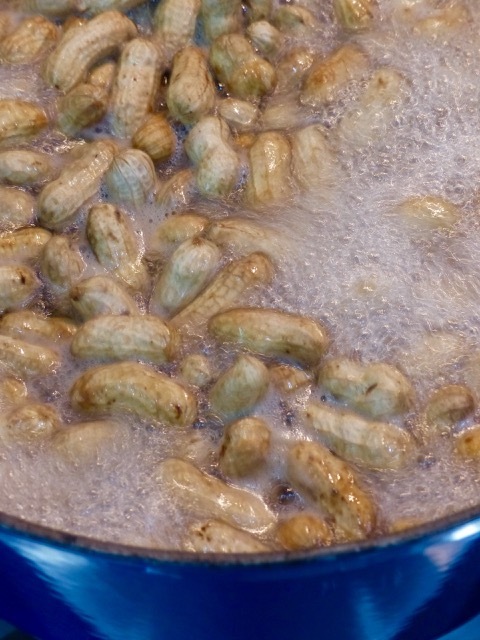 Although boiling fresh peanuts is a hit or miss thing for me. Next time, Doc, add some star anise, rock salt, sugar to peanuts and boil to death! Mamani! growing up it was almost mandatory that we stopped in Tagaytay crossing to buy cooked peanuts for the remainder of the trip to Nasugbu. Our beach trips never seemed complete without a large helping of peanuts in the car, or whiling away the heat of the midday sun at the beach. Here in Houston, you can buy plastic bag of newly boiled peanuts in most Vietnamese market. It’s a little softer than al dente. But in a North Carolina, they are boiled real mushy. In one of my visits to Quezon Province, I was invited to join. “peanut digging” . The young immature peanuts were then serve to us raw, after washing off the dirt. As a kid my grandmother grew peanuts in the yard. I remember eating raw fresh peanuts: milky sweet unlike boiled or roasted…. betty q .. thanks, will try your suggestion. Marilen…i buy about 2 pounds of fresh peanuts, wash, then put in a big pot. I add about 3tbsp. Kosher salt, 6 heaping tbsp. Sugar, about 4 to 5 star anise, 1 pouch or packet of Imperial seasoning pouch (Asian stores). Then fill pot with water, a plate on top of the peanuts. Then I adjust salt/sugar adding more water if I need to halfway thru the cooking process and remove the plate. When done, I let the peanuts cool in the liquid so it absorbs the taste. If you eat it right away, walang lasa! I have taught my Canadian gardener friends how to eat our peanuts! They found the texture interesting but taste wise, they found it addicting and I got them hooked to boiled peanuts with a Chinese flair! For leftover boiled peanuts, we sun dry it for long term storage. my family loves boiled peanuts, and my Mom loves them mushy, so she boils them up for a few minutes in the pressure cooker. Eating boiled peanuts also brings me back to my childhood. Maybe because it was the “in” snack during that time. No one seems to be able to come up with a figure of how long to boil them for. An hour? More? Given the dire warning of what happens if you underboil them, a general ballpark figure would be good. My parents are from the North (GI’s) and I was born and raised in CDO – but I got these boiled peanuts in both places and in most places in between. I grew up with them, and trips to the beach are not complete without them. MIllet: pressure cooker! Why didn’t I think of that?!? I’d usually boil for 1hr +/- 15 mins. How long does it take in the pressure cooker? I love boiled peanuts! It’s my merienda whenever I’m at home in Isabela. It costs P20/Caltex (repurposed oil can container :D). I can finish 1 Caltex in one sitting! I like it better when the peanuts gets reboiled the following day. More flavorful. Really love the soft boiled peanuts served at Century Seafood Restaurant. It smells like they’re adding some 5 spice powder and cinnamon. Anyone knows how to cook it? Thanks.